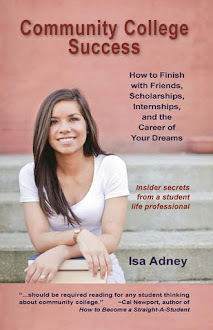 Community College Success: Ask Isa: "Can I reach my dreams if I had a low HS GPA?" Ask Isa: "Can I reach my dreams if I had a low HS GPA?" I want to go into investment banking and work on Wall Street some day, but here is thing: my high school GPA is low, I've never participated in any activities, and I don't have all the prerequisites for a 4-year school. I've decided to start out at a junior college for a year and hopefully transfer to the University of Pennsylvania (as you can see I have high standards). Is there still a possibility that I can get into the school if I change things around when I get into junior college, or should I just forget about Penn and look for somewhere different? I love that you have high standards and I say go for Penn. However, since I'm not an admissions officer I'm not an expert on how they evaluate transfer students' high school background and what is needed to get admitted (I suggest starting your research by reading everything on their transfer site). As soon as you can, visit the campus, go on a tour, and meet with an admissions officer so you can ask any questions you have. Ask for brutal honesty. And even if after all that research you find going to that school won't be a reality because of your high school past, I say keep on going and start looking into the next-best college you'd like to attend. The process of researching options in this way will serve you in every aspect of your life. It's never too late to reach your dreams. The key is to be open to how you get there. I believe 100% you can make it to Wall Street if you really want it and put in the work. Community college is a great way to turn your academic past around. I've heard so many stories of students who didn't do well in high school who then get a 4.0 in community college and transfer to a selective university. I believe in most cases low grades are simply a product the natural unmotivated state that results from not seeing how your current actions can help you get somewhere you want to go. Since you've figured out what you want to do and seem excited about it, you should have the motivation and focus you need to give your 100% to community college. I also recommend reading How to Become a Straight-A Student and my book Community College Success to ensure you're using the right strategies. Pay close attention to the third section of my book which teaches how to reach out to mentors who have your dream job (e.g. you should be connecting with people in finance as soon as possible, and start researching how to get those coveted internships). You can do this. Don't give up. Explore every option. And remember there are many avenues to get to where you want to go. People who set big goals, as long as they're not rigid about how they achieve them, succeed far more than they ever would have had they not set goals at all.